It may be a "Long way to Tipperary" but today we are going right into the heart of it! Specifically to Cashel of the Kings, the seat of the kings of Munster for many years and later of bishops. 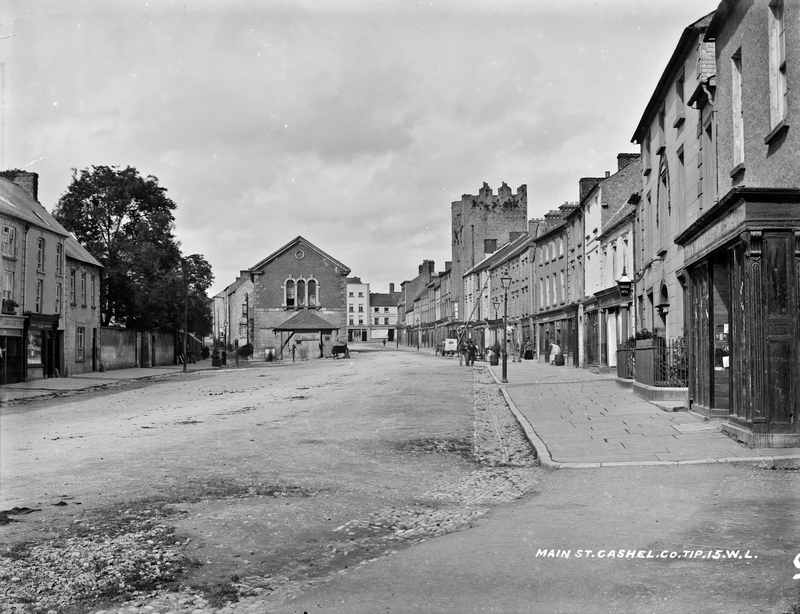 The main street always had an elegance about it despite the S bend at the top or Dublin end. Before this 1895 Croke Cross. [https://www.flickr.com/photos/[email protected]] Maybe! The OSI 25" map shows a Market Cross in a different location up near Friary Street and is allegedly from 1903. Yes - This Celtic Cross is called the “Croke Memorial” and was carved as a monument to Thomas Croke (1824-1902 C.E.) in 1895. Thomas Croke was the ArchBishop of Cashel and Emly from 1875 until death. It was originally located at the junction of Main and Friar street, but was demolished in a accident, a replica made, and relocated to the gable of the City Hall. The gable of the Hall is brick here so we are earlier than this archive shot L_ROY_08488 in which it has the modern facing. In todays shot I see a Pharmacy in the distance right of the Town Hall, in 8488 Ryan's Commercial Hotel occupies that building. [https://www.flickr.com/photos/fotosbyjohnh] Yikes! I had better behave myself! Mr French took heaps of photos of Cashel Main Street on at least four different occasions, just by the various names and state of the Mullins shop (above). This reverse shot, L_ROY_00016 - catalogue.nli.ie/Record/vtls000326655 - must have been taken at the same time due to the very long ladder outside No. 21 (Mullins) which had not yet been restored and frillified. Which proves that we are 1897 +, when the original Croke memorial was unveiled. (24/01/1897 via trove.nla.gov.au/newspaper/article/115468612 ). And before Mullins was rebuilt ... when was that ... ? Here is Philip Ryan Hotel Propr, in 1901. His hotel has 12 windows to the front, and there is an Apothecary shop next door. W? Galbraith pharmaceutical chemist, lives next door. By 1911 his son William Patrick is proprietor and the Pharmacy is gone, the hotel now has 22 windows. So, we are earlier than 1911, anyhow. [https://www.flickr.com/photos/gnmcauley] It must be before 1906 - see your own last comment on the Mullins photo. [https://www.flickr.com/photos/beachcomberaustralia] Agreed - several of those Market Day shots are 1906, and this is earlier. [https://www.flickr.com/photos/[email protected]] Cautiously optimistic that SmugMug will be a Good Thing for Flickr. Tho I always thought google would do an excellent job of developing Flickr's possibilities. I like the change to pink/blue doughnuts in the header. Mmmm, doughnuts. Here is this lawrence for sale on eBay in postcard form. Sadly unposted, so no help with dating.